The Orchards Holiday Park is located in the charming unspoilt village of Newbridge near Yarmouth, five minutes from the ferry. It is situated between the Downs and the Solent shores. A country setting amidst beautiful scenery with exceptional views all round. The Orchards is an award winning park. We are very proud of our David Bellamy gold award for conservation, our English Council Rose award for luxury holiday caravan accommodation and our English Tourism Council award for caravan and camping. Our facilities include , heated toilet and shower blocks, indoor and outdoor heated swimming pools, takeaway, large shop, self service laundry, dog walking area, pool room, table tennis and outdoor play areas. You will find our facilities of a very high standard and our staff very friendly. 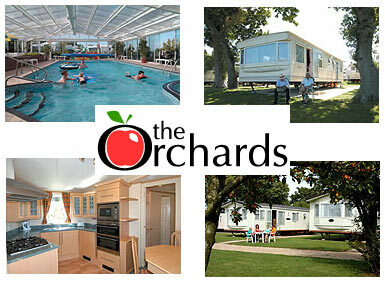 The Orchards is a family run park for families or couples looking to escape the pressures of everyday life.It is an ideal base for walking, cycling, golfing, sightseeing, beach holidays or visiting the many attractions the Island has to offer. We have 3-4 night breaks available and we can book the ferry for you.